Zoho Sprints is an online agile project management solution designed to help agile teams plan their project, track their progress, and deliver the appropriate product on time. The simple and clutter-free tool takes care of keeping timesheets, monitoring the task statuses, preparing meetings, and overviewing the analytics. Given that agile teams function with a core value on responding to change and working with a sense of urgency, having a system that augments this type of operation is vital. Zoho Sprints is a dynamic software that is quick and easy to set up, so you can immediately invite your team members, assign them roles, build a backlog, and commence your sprint. It is part of the revolutionary suite of software solutions by Zoho designed to help businesses in various aspects of their operations. Hence, you can easily integrate Zoho Sprints with Zoho’s other applications in marketing, sales, accounting, customer support, and more using a single login and password. Knowing how far or how near your team is to project completion is essential in staying within schedule. The Scrum Board provides visibility and transparency to everyone’s progress. All recent updates are reflected in the team Feeds. You can customize the project status based on specific requirements and stages. You can also label them with “to do,” “in progress,” and “completed” for easy identification. You may reopen tasks, close bugs, and transfer stories using the drag-and-drop method. All these details make sure you won’t overlook anything through sorting items into swimlanes according to estimation points, priority, and story. The Sprint Activity graph makes it possible to oversee any changes made including items that are added, closed, reopened, moved, and remained idle. All members of your team can log their billable and non-billable hours into the system. Through this, you can easily track and tabulate your team’s time logs. The members can choose which item to work on and log the time they spent working on it. The global timer lets you start, stop, or pause the timer for certain items so you can view the day’s work breakdown. Meanwhile, the scrum-master and product-owner can approve the timesheets with a single click. This helps to estimate how much time is needed for the next sprint and complete invoices efficiently. Tasks can easily pile up on top of each other. If not monitored, tasks with high priority may be overlooked. Zoho Sprints lets you create sprints and backlogs for each project. With its drag-and-drop feature, moving the hierarchy of tasks according to its importance and urgency is quick and hassle-free. There are also reminders and set durations to alert everyone in the team with any newly released sprint. 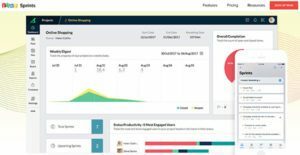 Keep an eye on your project through the Dashboard where you can see an overview of all vital metrics. This lets you distribute and assign work to your team members smoothly. This data lets you identify working patterns and plan future schedules and tasks. The Velocity chart gives you the project delivery rate of your team and helps you estimate future sprints. Meanwhile, Burndown and Burnup charts show you your team’s pace towards reaching the project line. The Cumulative Flow Diagram is essential for determining alterations in work progress and identifying bottlenecks. These data provides actionable insights to improve your team’s productivity and efficiency. Managing meetings is made easier by doing a hassle-free search for upcoming and completed meetings. Reminders will be sent to each participating team member’s feed and email to ensure everyone will be present at the meeting. Since meetings are vital to agile teams, doing face-to-face appointments improves the team’s workmanship. Online discussions improve real-time collaboration with your team. Zoho Sprints can be accessed through Android and iOS devices so everyone can collaborate anywhere at any time and stay updated with reminders, feedback, and announcements. There are well-liked and widely used solutions in each software group. But are they necessarily the best fit for your organization’s unique requirements? A popular software solution may have thousands of subscribers, but does it offer what you require? For this reason, do not blindly invest in popular systems. Read at least a few Zoho Sprints reviews and think about the factors that you wish to have in the software such as the fees, main functionality, available integrations etc. Then, select a few apps that fit your needs. Check out the free trials of these apps, read online comments, get information from the maker, and do your homework thoroughly. This in-depth groundwork is sure to assist you choose the most excellent software application for your organization’s specific wants. How Much Does Zoho Sprints Cost? Zoho Sprints offers free and paid user-based enterprise pricing plans. You may start with a trial and upgrade or downgrade your plan as you prefer. For an annual plan, you will only pay for 10 months’ worth of payments. There is no long-term contract required so you can cancel your subscription anytime. We realize that when you make a decision to buy Agile Project Management Software it’s important not only to see how experts evaluate it in their reviews, but also to find out if the real people and companies that buy it are actually satisfied with the product. That’s why we’ve created our behavior-based Customer Satisfaction Algorithm™ that gathers customer reviews, comments and Zoho Sprints reviews across a wide range of social media sites. The data is then presented in an easy to digest form showing how many people had positive and negative experience with Zoho Sprints. With that information at hand you should be equipped to make an informed buying decision that you won’t regret. What are Zoho Sprints pricing details? What integrations are available for Zoho Sprints? Zoho Sprints integrates seamlessly with other apps from the Zoho software solution suite. There are also integrations with Zapier and Zoho Flow available. If you need more information about Zoho Sprints or you simply have a question let us know what you need and we’ll forward your request directly to the vendor.